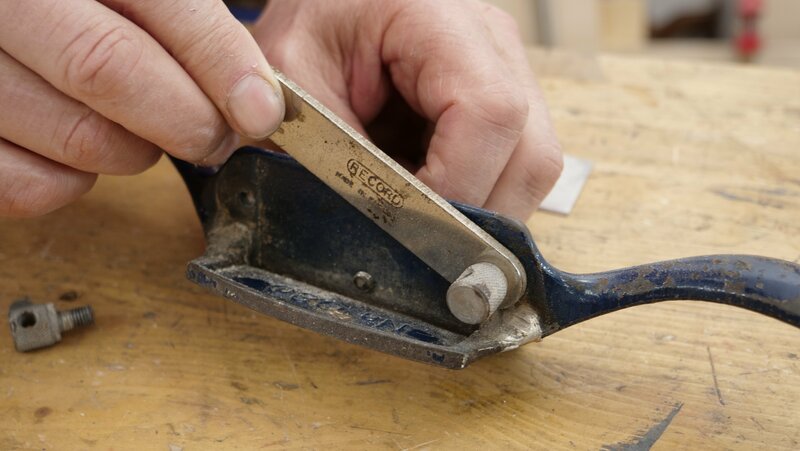 Whilst working on a flat surface, turn the adjusters to loosen the retaining bar and load the blade into the holder. The 45 degree angle should be facing the back. Pinch the bar and blade against the body of the holder, making sure the cutting edge stays flush with the sole, and tighten the retention setscrews to set the position. 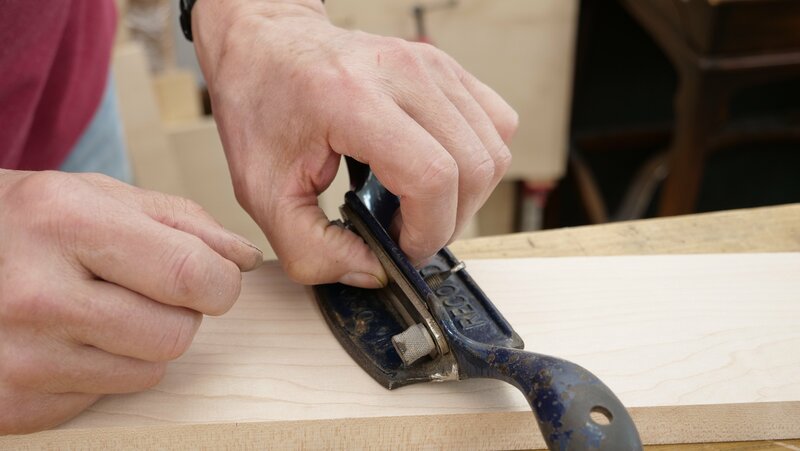 Use a scrap piece of wood to check the shavings are of equal thickness on both sides. By adjusting the central thumbscrew in the main body of the scraper, the blade is forced into a slight curve which then causes the blade to flex through the mouth of the sole. Further adjusting a tiny bit at a time enables you to set the depth of cut until shavings appear. 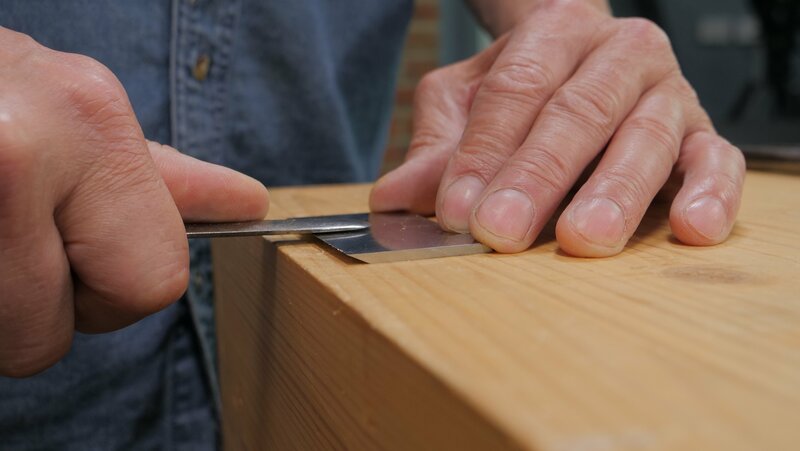 When sharpening the #80 scraper, the angle should be as close to 45° as you can get. 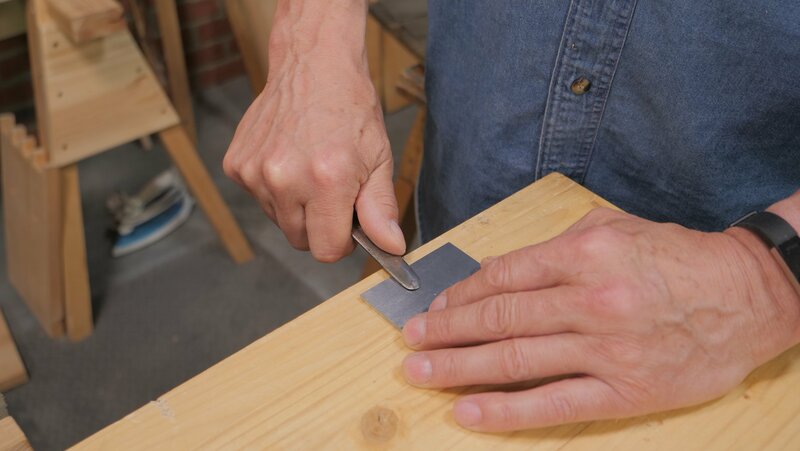 With the blade in the vise, use the flat file at a 45° angle using a continuous stroke from one end to another, this creates a smooth, straight edge. 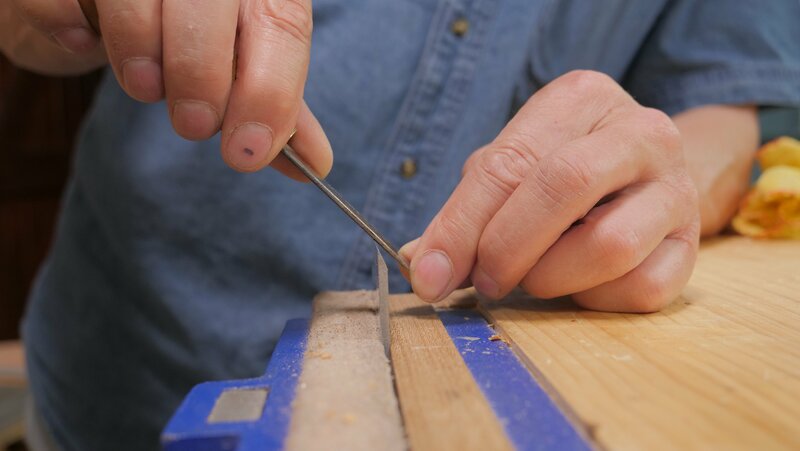 To achieve a 45° angle, you can measure and cut a piece of wood as a guide. To see how to make this, see Paul’s video here. To remove any unwanted burr, place the flat side (non-bevelled) against the super fine plate on the diamond plate and rub back and forth. 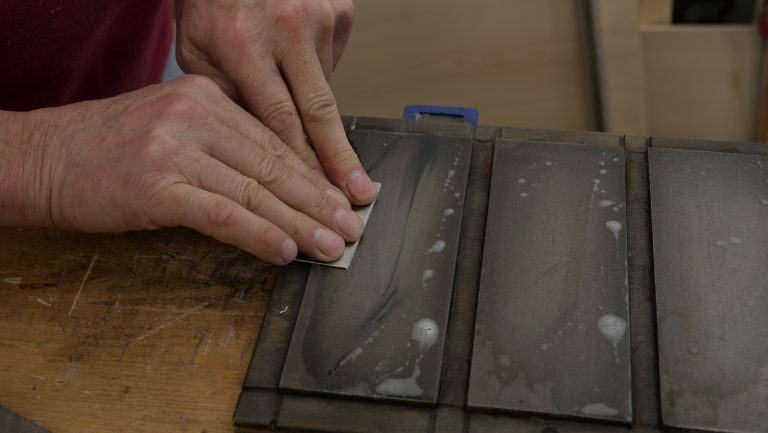 Next, flip the scraper so the bevelled side is facing down on a flat solid surface. Then run the burnisher along the face 30 times keeping it flat. 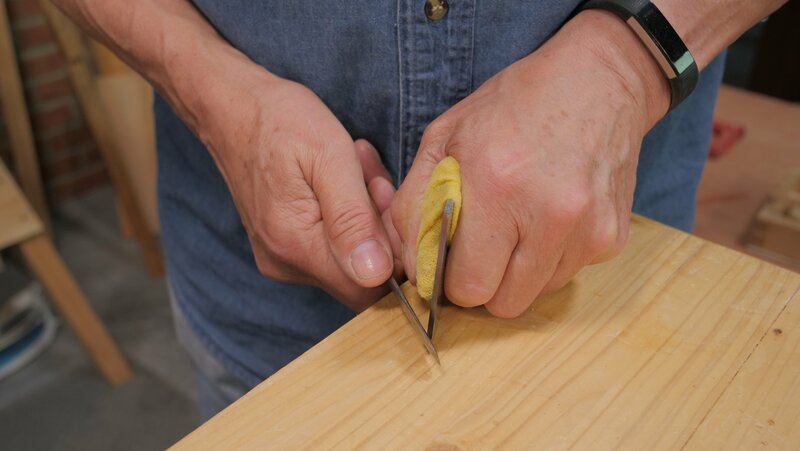 While holding the scraper on end against the workbench pressing down with your hand, use the burnisher against the bevelled edge and pull up 10-20 times, keeping the angle as close to 45° as you can. Make sure you have something to protect your palm from the scraper blade when doing this. For the final few strokes, increase the angle by a few degrees, this will give the scraper the turned edge. 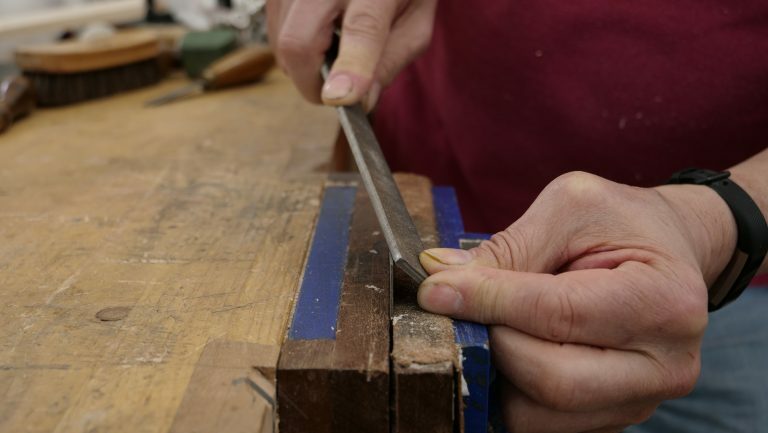 Repeat these steps on the other cutting edge if it has a 45° bevel. I am preparing my No. 80 scraper blade which is a Hock replacement blade and thicker than most. Should the corners of thicker blades be eased at corners like a plane blade? Or cambered perhaps to prevent digging in at corners? 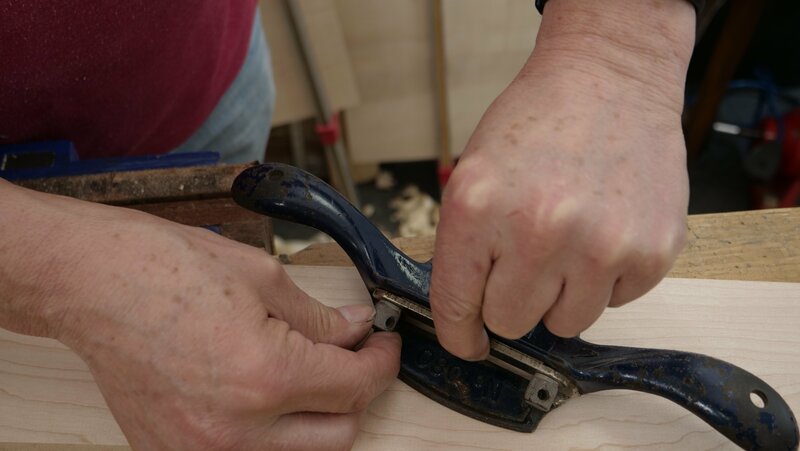 No we don’t round the corners on scrapers because the blade is flexed into the wood and the corners of the scraper blade remain flush with the surface of the holder. Do the thicker blades flex enough in your experience for example with Hock and the thick Rider blades? The Rider blades turned out to be useless (https://paulsellers.com/2018/01/axminsters-80-cabinet-scraper-uh-oh/) because they were too hard to be sharpened and the blade edge could not be turned. I’m sure the Hock irons are fine, because his irons tend not to be too thick but why not just use the existing blade (unless it’s a Rider). Thick irons are of no real value and they take longer to sharpen. Any reason not to use a honing guide for No. 80 irons? At a projection of about 17mm it produces a 45 degree beveI and I noticed you use one on the thinner blades/irons in the article: “FAITHFULL #80 BENCH CABINET SCRAPERS OK”. I’m assuming just to be careful not to overnight and bend the blade/iron in the honing guide? Often you can’t get them in the honing guide because the blade is too short. Secondly, the honing guide bends the plate into a curve and therefore the blade comes out convex along the edge rendering it useless. The truth is, if you don’t bend it there’s not enough holding power in the guide.